Around this time of year, when strawberries are delicious and affordable, I get a hankering for strawberry shortcake. I used to make it as a biscuit-like "cake" because that's what I always thought of when I pictured strawberry shortcake. But it wasn't my favorite and it made no sense - it's NOT cake! A few months ago, I made a really delightful gluten-free strawberry cake for a dinner party and I loved the texture, which made me think - duh! ShortCAKE! And, this delicious beauty was born (and devoured). It's simple and perfect! Preheat oven to 350 and grease a 9x12 non-stick baking pan. In a large bowl, beat together butter and sugar for 2 minutes and then add eggs. Beat until smooth and add vanilla. Mix well. In a separate large bowl, whisk together flour, salt and baking powder. Add the mixture, alternating with the milk, to the butter / egg mixture and stir until combined. Pour into the prepared baking pan and bake for 20-25 minutes. Slice strawberries and combine in a bowl with the sugar. Set aside and let them mascerate while the cake cooks. In a large bowl, whip the cream until soft peaks. Add the powdered sugar and continue to whip until stiff peaks. Stir in vanilla bean paste and set aside. Remove the cake from the oven and let cool. Cut into squares and then slice each square in half. 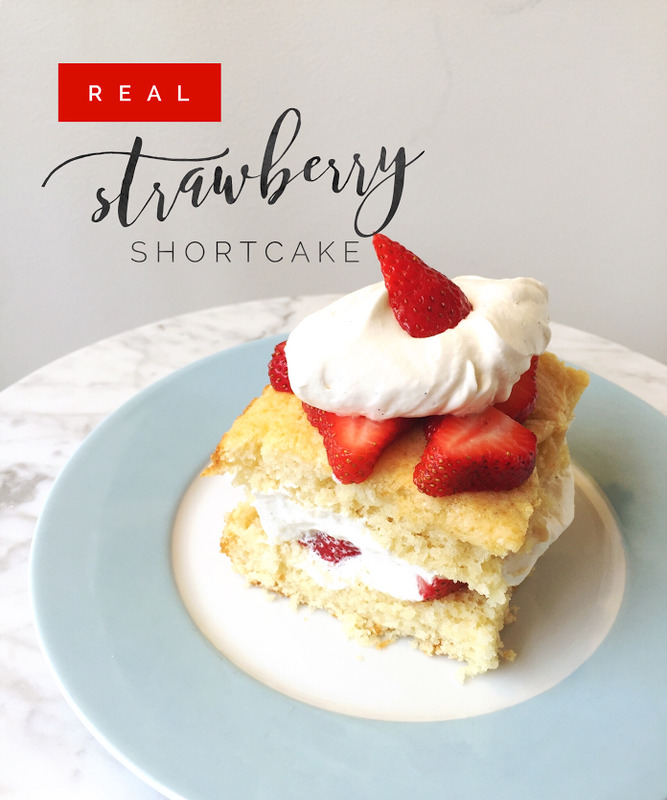 Layer strawberries, whipped cream between each layer and serve. Is this the same recipe as the gf cake you referenced except using gf flour? I am celiac and always looking for good recipes.